Charles Horace Mayo (Service Number 6/798) enlisted for the First World War with a Peterborough Street address. Charles Horace Mayo was born in 1885 in Stockport, part of Greater Manchester, England to parents Mary Ann and Stephen. Stephen, an engine driver, and Mary Ann had five other children. Stephen later moved with Mary Ann to Crewe where he became a marine stone dealer. Charles probably arrived in New Zealand in 1912 via New South Wales. He was certainly in Christchurch by August 1914 as he enlisted from his digs at 146 Peterborough Street. He had also had time to join the Christchurch Volunteer Battalion (Territorials). 5 foot four, with brown hair, blue eyes and a dark complexion, Charles joined the Canterbury Infantry Regiment. Training at Addington started immediately. Drilling, route marches, field work and nights under canvas became routine. He left with the Main Body of the New Zealand Expeditionary Force for overseas service on October 16th 1914. 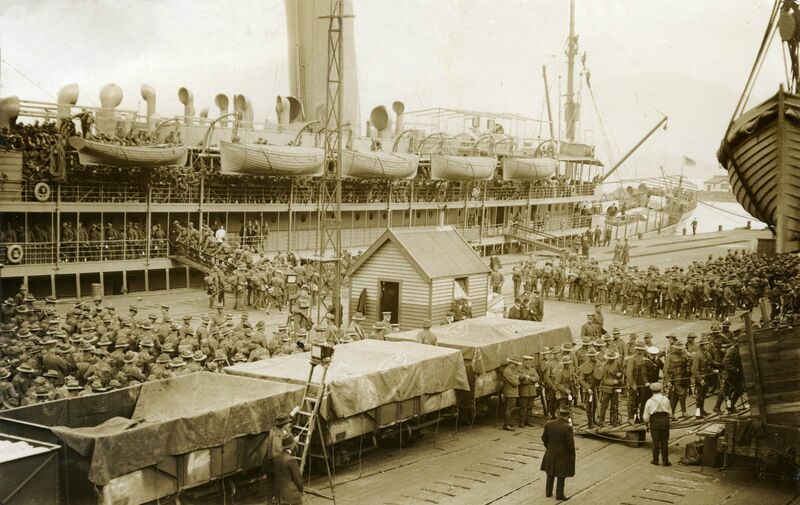 The New Zealand troop ships went first to Hobart then onto Albany where they joined up with Australian vessels. On the 1st of November 38 Australian and New Zealand ships steamed out of the King George Sound bound for Egypt. The convoy reached Alexandria on December 3rd 1914 and the New Zealanders set up camp at Zeitoun, four miles out of Cairo. After several months’ further training and a brief stint defending the Suez Canal, the troops readied themselves for Gallipoli. Charles left with the Canterbury Infantry for Gallipoli on the 12th of April 1915. Within a month he’d been injured with a gunshot wound to his right side. He was admitted first to a clearing station, transferred to a hospital ship then transported on the Franconia to hospital in Heliopolis. He was well enough in July to re-embark for Gallipoli and Charles rejoined his Brigade there in August 1915. Charles was briefly re-admitted to hospital in November before being sent to the Base Depot at Anzac Cove. Orders to evacuate Gallipoli were received in December. Charles like many others would have been deeply relieved to retreat to the relative safety of Egypt. The Gallipoli campaign had cost New Zealand nearly 7500 casualties, including 2779 dead. In April 1916 Charles was on the move again, this time with the New Zealand Division to the Western Front. In September 1916 Charles was wounded again, another gunshot wound this time to his thigh. Treated in the field, he was transferred to No18 General Hospital at Camiers and then by the SS Cambria to the 3rd New Zealand General Hospital at Codford St Mary in Wiltshire. Next he went to theNew Zealand Convalescent Hospital at Hornchurch in Essex,England. Charles’s thigh wound was serious enough to see him further admitted to Brockenhurst and Devonport military hospitals in Hampshire and Devon respectively. Discharged back to duty Charles was assigned as a driver for the 1St Battalion Canterbury Regiment and to fatigue duty (general labouring). In May 1917 he was classified as unfit by the Medical Board and following a brief stint at the Discharge Depot at Torquay Charles finally returned to New Zealand on the Remuera in August 1917. He was discharged as “no longer fit for military service” in January 1918. He received the 1914-1915 Star, British War Medal and Victory Medal and had served for 3 years 140 days. An engineer in civilian life, Charles married Mary Ellen Patterson, nee Wager in 1925. Mary Ellen was the widow of James Patterson, Superintendent of the Sailors’ Home in Lyttelton who had been tragically killed in a Christchurch train incident in December 1918. Charles also became stepfather to Frances Joyce and Eric, Mary Ellen’s two children from her first marriage. Mary Ellen, like Charles, was born in Stockport and may have known him back in England, she certainly would have known him as a resident at the Sailors’ Home where she acted as Matron. The family moved to Takapuna in Auckland. Sadly their daughter Frances Joyce and grandson Russell both died in 1936. Charles was heavily involved in the Takapuna Amateur Cycling Club and acted as secretary. He was also a member of the Belmont Homing Society, pigeon flyers. He stood unsuccessfully as an endorsed Labour Party candidate for the Takapuna Borough council in 1938. Charles died in Auckland Hospital aged 59 in April 1944. After a service at Morrison's Chapel on Parnell Road he was cremated at Waikumete.